The discussion amongst fellow food lovers in Ireland has been split right down the middle over the past fortnight. On one side the excitement from those who love to forage and make things with elderflower was evident. On the other hand I spotted more than a few “foodies” lament that they didn’t like the stuff and can’t stand the foraging movement. Elderflower, according to more than one, is the new wild garlic. En vogue on food blogs and finding it’s pesky way into seasonal menus nationwide. Foraging was always something we did as a family when I was younger. Certainly it was mainly blackberries in the Autumn but I would be more than familiar with crab apples, damsons, wild garlic and of course that elderflower. I suppose I’ve taken some of this knowledge for granted. I naively assumed that most people think nothing of parking the car up on the verge beside a field in the middle of nowhere so that you can hare across and fill your pockets with chestnuts or blackberries. Apparently most don’t. That’s where this A5, pocket sized book from Evan Doyle (Macreddin Village and Director of The Organic Trust) and Biddy White Lennon (Food Writer, Journalist and more) fills the gap. I was expecting a cookbook but it’s more a starting point for going foraging yourself. I like the way the book flows through the seasons. You’re not going to find items by alphabetical order, more so by seasonal and harvesting order which is extremely handy. The concise photographs of ripe ingredients makes the book a point of reference that you’ll return to again and again. The weather being so cold at the start of the year means that elderflowers, normally in season until the end of June, are just about coming to the end of their season now. So I decided to make “Elderflower Champagne” and adapted the recipe in the book to slightly smaller quantities as I’d been quite selective as to which heads I chose to use. If you intend to forage I’d highly recommend you acquire this book, or another informed source as a fellow learned blogger (who shall remain nameless) recently discovered when they made cowslip cordial by accident. Dissolve the sugar in a small amount of warm water until you get a syrup. Leave to cool – I did this several hours before hand. Take a HUGE pot, peel the lemons into the pot, then juice them into the pot. Finally turn the empty lemons in. Pour in the cold water, vinegar and sugar syrup. Stir well. Shake off the elderflower gently to make sure there are no insects and rinse under cold water. Immerse them completely in the liquid in the pot. Stir. Cover the pot with a lid and a tea towel and put in a cool, dark place. Stir once a day for 4 days. After 4 days strain the solids off using a muslin cloth. I did this twice to make sure I got any last sediment, then decant into bottles. Leave the bottles in a dark place for 4 weeks before drinking. Slightly unscrew all the caps after 1 week to make sure they don’t get too fizzy. Disclosure: The O’Brien Press provided me with a copy for the purposes of a review of Wild Food. My opinions are my own and I am not paid to give them. I’m glad you included a photo of the elderfolower as I don’t know what they look like….shhh, don’t tell! I’ve always wanted to taste elderflower wine so I must give this a try. We forage every Autumn for blackberries and have just made our first raspberry cheesecake made from home grown raspberries. Feeling very virtuous indeed! Blackberries I think are the automatic food I think of when it comes to foraging alright! The raspberries are doing brilliant this year aren’t they? Might try this on Saturday. perfect timing. I made raspberry cordial for first time today using our home grown raspberries. was lovely. I normally make elderflower cordial but figured this was a great excuse to make the champagne. You can’t beat a decent cordial in this weather though! A couple of things I do differently. I just slice the lemons very thinly and throw them in – don’t bother with the juicing. And I find it is fiddly, but worthwhile, to take most of the stems off – I pull the florets off with my fingers. Sometimes the stems add both a bit of bitterness and a a taste that veers more towards the tom cat than the muscatel. And then there’s how big is an elderflower head? They are huge this year. One batch I made I only used ten heads to 5 litres of water because they were so big – other years I’ve used twenty. Glad you don’t use too much sugar – some people make it far too sweet. In hindsight I think slicing is better. I tried to stick as closely to the recipe in the book as possible though they don’t recommend peeling the skin. My second batch I did, as you say, pinch off the stems. The difference in aroma is huge so I’m sure it will make a flavour difference. Even with my lower sugar amount, I found it very syrupy. Yes the filter is fantastic. I leave mine to stand for a day & a bit before using. Can’t afford jug water filters so we pour off what water we need days in advance. Mine was slower starting too. I guess I could have left it a little longer before bottling but I was wary of small hands getting into the pot if I left it much longer! Experimented with using the mandolin for fine slicing – not a good idea. Flavour was great but we have to use the tea strainer every time we drink it. Back to the sharp knife next year. Great result from just picking the heads off with my fingers. I think i’ll stick to it! 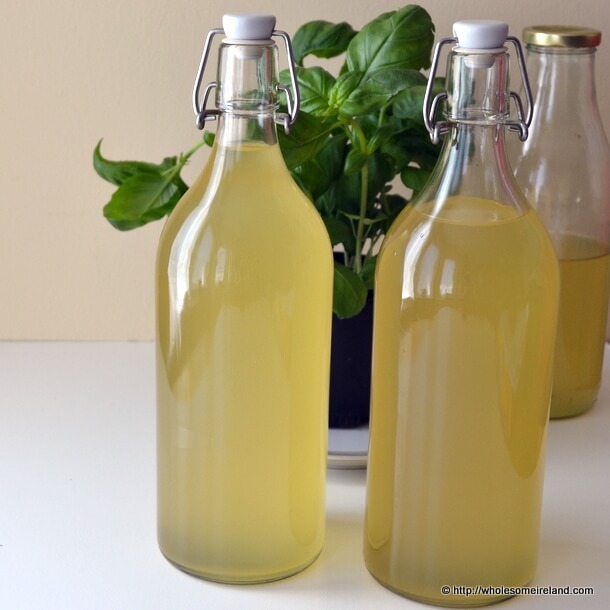 My hubby made this last night (slightly different recipe and method) and I made another batch of cordial (we used mostly white elderflower and the last few pink ones from our garden) – we are hoping for pale pink champagne and hopefully not all over the ceiling of the shed!! Will definitely be letting off some of the gas from time to time. We are loving the first batch of cordial which we made totally from pink elderflowers – hoping the mostly white one turns out as nice. Oh that will be interesting. The pink elderflowers are gorgeous. None around here but plenty of white. I’ll keep my fingers crossed for your shed roof! Sorry, I can’t take in anything else after reading about the person who thought cowslips were elderflowers….Ah, go on, tell us who!!!! It’s actually just gone beyond season now at this stage. All of the trees in my area (also east coast) have stopped flowering. If you are going to use the pink elderflower that is in a pot, only take 1/3 of the flowers – you will want to allow some of the flowers to turn into berries. Enjoy! Thanks Lynbw I’ve found the same. this sounds like a fab book I may have to get my hands on it, I’d love to do a bit of foraging with my wee lady. the joys of living in the countryside! It’s a good book for beginners Tash I’ve found anyway. I know it might sound like a daft question but when you say 7 heads is it just the single one of each stem? A head is about 15-20cm in diameter – it has a number of flowering sections on it. You can snip the stem off before immersing though. I hope that makes sense? 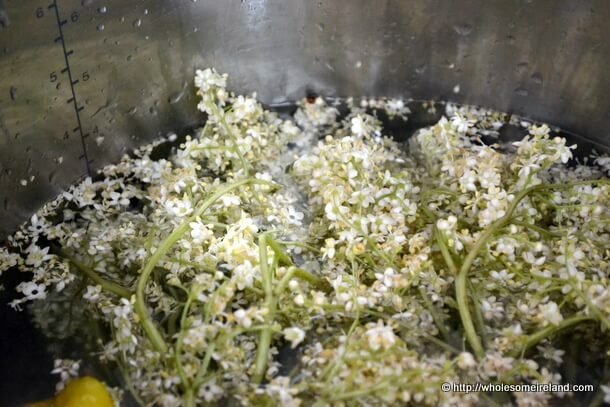 I am making elderflower cordial at the moment and some of the heads have turned from white to pink in the syrup. Is this normal? Safe? Yes Elma. They go brown/pink as they soak. They also go gloopy!